Just heard about Shimla Toy Train! We were just walking to the train station in Delhi to wait for our 10pm Shatabi Express train to Kalka, connecting with the toy train when we hit an internet cafe by chance and just read about the landslides and no train for two weeks....we booked our tickets a few weeks ago via the net so wouldn't have known until we'd just got on the train tonight. We've checked out of our hotel and are now stuck in Delhi, trying to figure out a Plan B...can anybody help with suggestions?? Should we stay in Delhi again tonight and try to head off somewhere in the morning or does anybody know of any trains leaving tonight to a different destination that may be worth going to! We had our HP itinerary all planned for the next two weeks and now the proverbial spanner has well and truly been thrown into the works. Any new itinerary suggestions very welcome. We were counting down the minutes waiting to get out of Delhi and hit the mountains, can you believe it! I´ll be in the same position ten days from now , hoping that at least the road from Kalka is clear by then. Koti looks pretty shot for the moment , though. Trains from (Old) Delhi station tonight with availability. Train 5013 Delhi 22:40 Kathgodam 05:45 only availability in Sleeper Class (not air con). Availability in 3-tier air con and Sleeper Class. 10 minutes ago this train had availability in 2 & 3-tier air con and Sleeper Class, now it doesn't. I think the availability details are no longer available because the reservation chart has now been prepared (usually about 4 hours before departure), so go to the station and enquire. Because it is so close to departure, you may have to buy 2nd class unreserved tickets (very cheap) for the length of the journey, then get the ticket man on the train to upgrade you. The availability quoted above was high, and was checked only 10 minutes ago, so...take the gamble and go to OLD Delhi station (the one near to Kashmir Gate), not New Delhi station. Thanks for the suggestions Steven...we did a scan for seats and then ran to Old Delhi station to see what we could pick up. Most trains had waiting only or were full so we ended up coming back to wrangle our room back in the hotel (which we got - very funny arriving back again to a gleaming room all made up for new guests). Guess we'll now be doing our Rajasthan circuit before our HP circuit (were gonna do it the other way round), but after the mild panic earlier, we're happy enough now that we know we're on the move in the morning..
That was a major fluke to check the net earlier and find out about the landslides. We'd be on the Delhi-Kalka train right now and oblivious to what awaited us if we hadn't heard the news! Those pictures are fairly shocking alright vistet - can't see how they'll have the tracks repaired enough to hold a train in two weeks though...it'd be quite hairy trundling over them even after they've been repaired methinks!! I feel kind of guilty, I read about all the train disruptions and rarely post anything on indiamike about them, basically because I'd be starting a couple of new threads every week. But I've been away from home and only read about the Kalka-Shimla track today, I think I might have started a thread about that one if I'd seen it earlier. If you're doing the Rajasthan circuit and you'll soon be in Udaipur, I assume you'll head to Jaisalmer at some point (or Bikaner). You can now get a daytime train from Jaisalmer to Bikaner (the train will change to an overnight train soon, but the overnight one may already be running). "Those pictures are fairly shocking alright vistet - can't see how they'll have the tracks repaired enough to hold a train in two weeks though...it'd be quite hairy trundling over them even after they've been repaired methinks!!" I couldn't get the link with photos - I'm not sure I want to see them - too frightening. I've not travelled the Kalka Shimla route, so can't comment, I seem to remember a glass observation car, but don't have details, it may have been seasonal. The Shivalik express looks kind of special though, very cosy, do a search on indiamike or on google to view the inside of the carriage. Also look at the bottom of the following link for some info regarding a glass observation car. i am planning a HP trip in late sept to mid-october, and had not planned on the toy train until read about it on INDIAMIKE. assuming that the line will be up 'n' running in 6 weeks (? ), is it possible to get to kalka on-time from delhi. does the connection wait if the delhi train is delayed, etc.? is there a time of day that is best to take the toy train from kalka to simla? Off the "beaten track"? If you can get there, it is ruined. I cannot comment on the observation car. But sit on the right side while going from Kalka to SHimla for better views. Do you know if we reserve right side seat tickets in advance? The observation car only runs in high season I've learned and we'll be there after that. i've heard it will take 2 weeks to restore the rail traffic. While reserving, I think you cannot know if you have a right side seat or a left one. Tell the reservation clerk if he/she can help. "“We were planning to run a train between Shimla and Dharampur. But now tonnes of debris has blocked a stretch of the track between Kannu and Kaithlighat”, said divisional railway manager (DRM), Ambala Division, H.K. Jaggi, who visited the spot today. But now the plan has been abandoned. 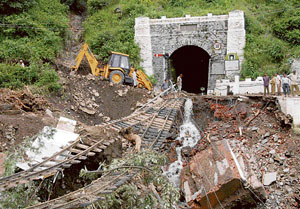 Sources in the railway said the restoration work at Koti had not picked up pace as water was still flowing down the mountain slope, which had damaged the 104-year-old Koti railway station. The work would pick up pace once the water stopped flowing in the rivulet." On the other hand the roads seems to be working , another story mentions the apple harvest now being transported again.